(AINA) -- The Supreme Military Court started today, December 27, procedures in the trial of three soldiers on charges of "manslaughter" of 14 Christian Copts during the Maspero Massacre which took place in front of the radio and television Building in Maspero on October 9. According to the indictment, the list of defendants were limited to three soldiers from the military police, who were charged with manslaughter, which under the penal code carries penalties of imprisonment of not more than seven years. The military prosecution accused the three soldiers of causing "through their mistakes caused by their neglect and lack of precaution" the death of 14 people from the crowds in front of the Radio and Television Union Building. The indictment went on to say that the drivers of vehicles and armored vehicles of the armed forces " drove randomly and did not match the condition of the road, which was full of protesters, leading to their collision with the victims." On October 9, 27 Christians were killed, 14 crushed under the wheels of military armored vehicles and the rest by being fired at with live ammunition. Another 329 Christians were injured. According to witnesses and video footage, the protestors were chased by armored vehicles chased over the pavements (video) and were shot at by snipers placed in the TV building and over bridges overlooking the TV Building (AINA 10-10-2011). 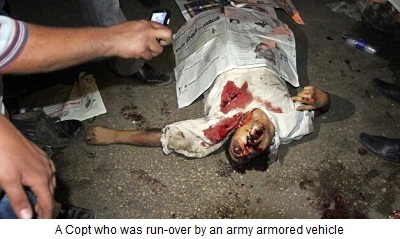 The Egyptian Initiative for Personal Rights (EIPR), a independent NGO, said that the military justice took into account only those victims who were trampled under the wheels of the military armored vehicles and excluded those victims who were killed by live bullets, including the prominent Coptic political activist Mina Daniel, known from the January 25 Revolution. EIPR said the trial did not meet the minimum guarantees of seriousness and justice and is a continuation of the position of the military junta, which refused and still is refusing any recognition of its responsibility for this heinous crime which resulted in killing 28 protesters, mostly Copts. It also accused the ruling Supreme Council of the Armed Forces of continuing to seek the protection of members of the military police from criminal accountability by bringing the three soldiers before a military tribunal, even before the investigating judge assigned by the public prosecution has completed his investigation into the same incident. Hossam Bahgat, director of EIPR, who was honored this year by Human Rights Watch for upholding the personal freedoms of all Egyptians, said "Nearly three months after the Maspero massacre, the junta decided to select 14 of the victims of the massacre who were crushed under the wheels of the military armored vehicles, in front of our eyes and on television, and then go on to consider them as "victims of negligent military drivers, as if they died in an ordinary accident." Commenting on the indictment, Bahgat said "How can the killing of 14 citizens be considered a manslaughter misdemeanor? What about Mina Daniel and the rest of the victims of the massacre who were killed by live bullets? And why has the military decided to quickly make this mock trial without waiting for the report of the investigating civilian judge of the massacre? How can we trust in the military justice? We see them making every effort to shield its members and its leaders from accountability." Observers say the main purpose of the military trial is to confirm the account of the massacre given by two members of the Military Council at the press conference which was held on 12 October, during which they denied that the soldiers guarding the television building were armed, and instead accused the unarmed Coptic demonstrators of attacking the military police forces. They also said that the drivers of the armored vehicles were confused and trampled over the demonstrators. To prove their point, the police randomly arrested 27 Copts from the streets (AINA 11-5-2011), in addition to the prominent Muslim activist Alaa Abd El-Fattah, and accused them of inciting violence, the murder of one soldier, the theft of guns from the armed forces, and damaging private and public property during the October 9 Maspero Massacre, They were all released last week after being detained for 66 days (AINA 12-20-2011). Ahmed Hossam, a lawyer with EIPR believes that no justice will ever be received for the victims of Maspero, or victims of any of the other crime committed by the military against the Egyptians, as long as the provisions of Code of Military Justice stands as a barrier to the ability of the prosecutors to investigate with the military in cases referred to them. Activists have previously called for the need to amend these provisions to put an end to the impunity enjoyed by military of accountability to civil courts in crimes against civilians.